The Domke F-2B Original Ballistic Shoulder Bag (Black) is made to carry 1-2 digital SLR cameras with 6-10 lenses and accessories. It is made of 10560 denier ballistic nylon. The shoulder bag is made to hug the shooter's hip closely. It has a access to the equipment with a great space-to-size ratio. The bag features a removable padded bottom, military-specification hardware, webbing and adjustable closures. There are six compartments including a four compartment padded insert and six pockets including two side pockets and two front pockets. The non-slip Gripper Strap runs completely around the bag. Included is a removable hand carrying strap. 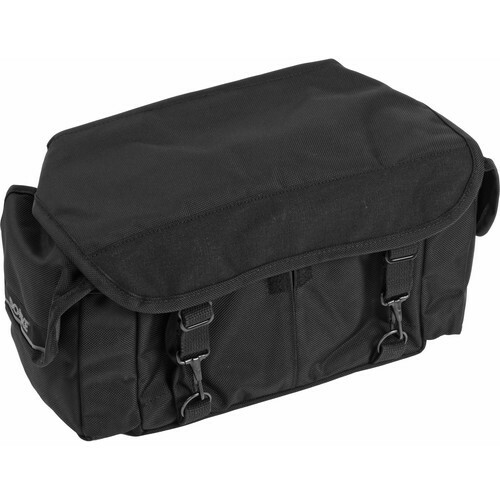 Box Dimensions (LxWxH) 17.6 x 8.5 x 6.2"
F-2B Original Ballistic Shoulder Bag is rated 4.4 out of 5 by 16. Rated 5 out of 5 by RRS from Simple is best! Simple is best! This bag is wonderful and can contain a deceptively high amount of gear (I carry 2 Nikon bodies, 3-4 lenses, flash, cleaning equipment, filters and wipes) in a relatively small form factor. Part of the reason, is that the bag is designed differently than the typical overly padded camera bag (my previous bag was a Tamrac). I also like the fact that the bag doesn't scream I am a camera bag with expensive equipment inside to observers, and could easily be viewed as a standard bag. The steel latches on my bag are also very secure and discourage any would-be pickpockets. I prefer the very rugged ballistic nylon to the canvas versions, but I am sure either choice will probably suit you. If you carry a lot of gear, be sure to purchase the shoulder pad as well. Highly recommended! Rated 5 out of 5 by Tom M. from Love this bag. I love this bag. I have been us Domke F-2 bags for almost 30 years. My current F-2 in black canvas finally got so beaten up that it did not look professional, unless you were another hard-working photographer. The F-2 bag is a work horse and just holds a ton of stuff. I currently have it filled with a camera body, 5 lenses, a teleconverter, Quantum battery, flash unit, my Hoodloup, dust rocket, memory card holders, spare batteries, cables, and other incidentals. Features of the this new nylon bag that I really like are that is is a little stiffer and stands up better. Also, the compartment under the main flap is no mesh so you can see what is inside. And lastly, the 4-compartment padded unit that holds your lenses has adjustable velcro dividers which is great since all lenses are not the same size. Wish I had bought this sooner. Rated 4 out of 5 by Geno from Solid workhorse Use it all the time, it's almost perfect. When you get it's very rigid and overtime it adjusts to your wear and tear. I really like the simple layout of it! My only problem with is the clips that hold the cover. When you close it, the clips can get inside flip inside the bag and come in contact with lenses (which at the weddings are generally exposed) I think a cover of sorts would be great. Rated 4 out of 5 by Hortwizer from Don't judge a book by it's covers It's great for stuffing loads and loads of equipment though it look small from the outside. Durable and usable in any type of weather, it puts your mind at ease when carrying your equipemnt. It's really one of the best camera bag i've own. Rated 3 out of 5 by wilsonphoto from Good - but........ I have had my F-2 for a couple of years - it has travelled worldwide with me. After constant use the nylon is beginning to fray. The velcro closures are pulling the ballistic nylon and creating bird nests all over the front of the bag. On the back, where it would come in contact with my hip, it is also fraying. I have gently trimmed back the fraying, but it is recurring at a fast pace. I will retire the bag this week. I will buy another Domke - just in canvas like my originals, which are still in great shape and constant use after 26 years. For those of you asking - I did contact Domke/Tiffen. after two e-mails and having sent requested photos of the damages, they will not return my contacts. So much for standing behind their product. Rated 4 out of 5 by Anonymous from Great Bag Currently using the bag to fit; Canon G11 Mamiya 6, 50mm and a 75mm lens. Light Meter Filters Film and other misc items. Can easily fit in a pro Canon kit, having used it to carry a 1d MarkIII too, with a 24-70 L and 16-35 L. Brilliant for people on the move who want a bag that doesn't scream look at me and yet still fit ridiculous amounts of equipment. Rated 4 out of 5 by ThomY from Good Bag but I have enough camera bags to get my wife PIS*** off when I buy another & this one replaces a F10 bag. I use 2 Nikon DSLRs with battery packs & when trying to place the camera with a 90mm Macro it got cramped in the bag, putting both cameras in the bag along with flashes & other necessary stuff would be impossible. I usually carry one camera around my neck so this is not a problem but saying this bag will carry 2 large DSLRs with zoom lens is a stretch. BUT I do like this bag over all the other bags I have. Rated 5 out of 5 by Anonymous from My man purse This sturdy, durable, and good looking camera bag has served me well, my last bag lasted at least 7 years, that's 7 years of almost everyday use. I carry my camera nearly all the time! I am a photography teacher in school and therefore take my gear with me to classes..it also goes on Scout troop hikes and camping, service projects, our kids' sport and performance events and yes even to church on Sundays. It also serves to carry my wallet, calendar, checkbook, pens, notepaper, firstaid kit, kleenex, aspirin, keys...you get the picture. To fit 6-10 lenses may be pushing it, but it is an efficient system geared toward easy access and adequate equipment protection. The only drawback for me is that the gripper shoulder strap wears out too quickly. I would not deviate from purchasing this bag again and again. Can the compartment dividers be moved around? Do they attach with Velcro? Yes, you can move the compartment divider, they attach with Velcro.